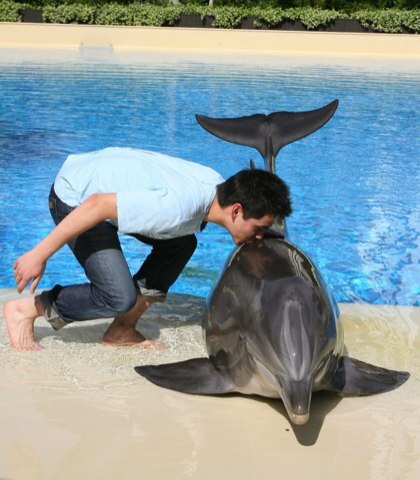 David Archuleta kisses…a dolphin! Taking a cue from bigarchiefan’s Song of the Week, let’s mark the end of summer with a couple of poolside photos. David and the Atlantic bottlenose dolphin. On May 3, 2008 the Top Four AI contestants flew to Las Vegas to see Cirque du Soleil’s “Love,” a tribute to The Beatles. The AI “Fab Four” visited the dolphin habitat at the Mirage Hotel. It was only a few days before on April 30 when David had received a kiss from Natasha Bedingfield and here he was in Vegas giving a kiss to a dolphin. Lots of kissing going on. I had to include this first photo because it shows David’s face and his sunny smile. But this is the picture that caused a ton of buzz on the Web. Fangirls wondered how the dolphin felt. Many fans would have gladly turned themselves into mermaids if they could! That dolphin’s life probably changed forever — notice the big smile on her cute face! 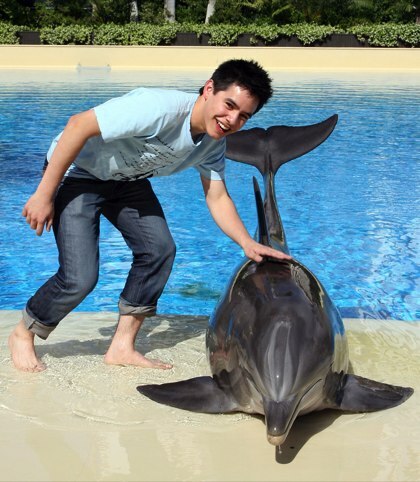 You’re right, the dolphin seems quite content, unlike David in a similar situation. haha! I had forgotten about the Priscilla kiss! I have a photo of David with the two blondes Brooke White and Kristy Lee Cook on either side ‘pretend-kissing’ his cheeks. So cute! Love this photo and I remember how excited I was when I first saw it. 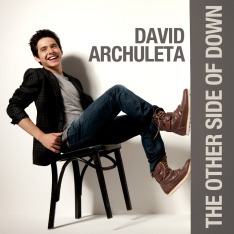 I miss those old Idol days when I had so much anticipation…running home to watch David. And ‘stayed’ at the PC for hours looking at new and ‘exciting’ news of him. Boy I miss that. So nice of you to choose this photo. And thanks for this blog I can still hear about David…daily!